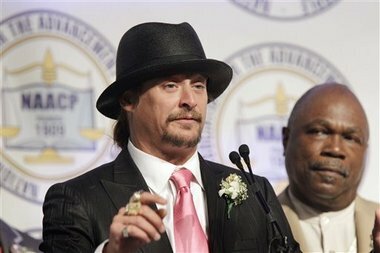 Kid Rock addresses the audience at the organization's annual fundraising dinner in Detroit, Sunday, May 1, 2011, as NAACP Detroit Chapter President Wendell Anthony looks on at right. *Moments after the Detroit NAACP bestowed Kid Rock with its Great Expectations Award at its annual fundraising dinner on Sunday, the rap/rock/country star made a speech that aimed to diffuse the criticism that has surrounded his selection as an honoree. According to the AP, he told nearly 10,000 people at the group’s annual Fight for Freedom Fund dinner at Cobo Center that his use of the Confederate flag during on-stage performances has nothing to do with how he feels about blacks. “I love America. I love Detroit, and I love black people,” the musician told the crowd. The Macomb County, Mich., native, real name Robert Ritchie, said his use of the flag derives from a popular song by legendary Southern rock group Lynyrd Skynyrd. Earlier, a group of about 50 people picketed outside Cobo Center in protest of the decision to honor the performer. The group also burned a replica of the flag, considered a symbol of racism and oppression to blacks in the South. It was carried by secessionist Southern troops in the American Civil War. The dinner is the largest fundraiser for the Detroit NAACP branch. Civil rights pioneer John Lewis gave the dinner’s keynote speech. Others also were honored Sunday night, but most of the attention was focused on Kid Rock. Detroit NAACP President Wendell Anthony said Ritchie was being honored for his advocacy of the city. From the time it was first announced, the choice of Kid Rock as honoree has been criticized by some who said the use of the Confederate flag conflicts with the National Association for the Advancement of Colored People’s message. 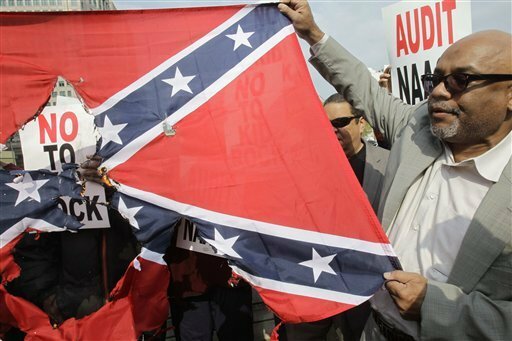 The Confederate flag symbolizes racial oppression, but also pride in the South for many Southerners, said Kirk Mayes, 35, of Detroit. Kid Rock, who appeared at the event with his son, received loud applause when he was introduced and again when he stood to accept the award. “I’ve never flown that flag with any hate in my heart. Not one ounce,” Kid Rock said before announcing $50,000 in donations from his foundation to Detroit recreation centers, a conservancy on the city’s Belle Isle, a youth theater group, a youth training agency and Habitat for Humanity. Ritchie met recently with Detroit Mayor Dave Bing and discussed how he could help the city, mayoral spokeswoman Karen Dumas said Sunday night. Ritchie also announced that his foundation would be donating $50,000 to storm relief efforts in tornado-ravaged states. His family-run foundation is very active in the Detroit area. It has supported the Detroit-based Karmanos Cancer Institute’s research and patient care, where Ritchie’s donations have included money, guitars and even an invitation to dinner — to the highest bidder. Through his “Made in Detroit” apparel line, Ritchie recently established the Made in Detroit Endowed Scholarship to help offset tuition costs of Wayne State University students from throughout southeastern Michigan who are selected for their academic achievements and limited financial resources. Only 50 people came out for the protest?!?!? No I don’t think Kid Rock is a racist, just misinformed. If he continues to use the flag with full-knowledge of it’s history with us “black folks” than he’s extremely insensitive…we’ll see. The NAACP messed up big time on this one! Indeed they did. What were they thinking when they were contemplating this award??? The NAACP has been MIA in this town for years now. The president “Swendell” Anthony has been reported to be on the take for year (he’s buddies with Kwame). He’s totally ineffective, married his daughters bff (which she was irrate about). New leadership is needed quick, fast and in a hurry if the “largest” chapter in the country is to survive. glad I’m not a member, they’ve supported Jesse AND his infidelities, OJ, when he was black again, MJ, sleeping with kids but, I have to say this kinda suprised me. I’m not surprised in the least. I bet that if Mel Gibson came out of hiding and gave the NAACP a few dollars they’d honor him too. If Kid Rock was honored by a jewish organization, would he lift up a nazi flag and try to justify it? For someone who claims to ‘love black people’, he is totally misguided and insensitive in this instance. As for the NAACP, they haven’t been for black people for decades especially since they’ve made the organization more ‘diverse’. Never was a member and will never be one. This is stupid. Seems like they are just making up reasons to come togehter and get dressed up and eat…. So the NAACP can be bought with 30 pieces of silver. That would be worth about 50 thousand dollars today. Those Uncle Toms should have been whipped out of Cobo the way the money changers were whipped out of the Temple. Do you think Bina Brith would give Louis Farrakhan an award for any reason? I heard next year they are going to honor David Duke. Where are the real Black people in Detroit. They should have revisited 1967. Those Black people knew how to treat disrespect. I guess they were among the half million Black people who have fled Detroit. John Lewis should have been slapped long ago for not supporting Barack Obama. He’s used up his “Selma Card” a long time ago. See?…shyt like “this’ is why I can’t even give this org. ANY money! Like…WTF are they giving THIS wiggah a FKN thang for aaaanyway!!?? And see?, he basically threw the shyt back in their/Our faces! Now NAACP?, WTF does “this” show/TELL yall as-ses!?? Hmmm? Maybe to keep Our shyt with/for…”Us”!?? Maybe! ?, HEH!!??? FOH! He has a biracial son with a black woman. What message is he sending his son? It is a flag it can not and has not hurt or hated anyone. The flag is a symbol of a war fought brother against brother. The civil war was fought over states rights. Slavery was thrown in after the start of the war. States rights the thing that was stomped on by the supreme court when they let 5 men make a decision that all stats had to let gays get married. So what’s next? If you think the Confederate flag stands for hate you need a history lesson in a bad way.